I was amazed at just how flexible the Pedoodles Toddler Shoes really are. I can easily bend them in my hand! The soles have good traction and they fit my daughter just perfectly. Her feet seem very comfortable and she loves to keep her shoes on even after we return home from being outside. We love that these shoes are truly eco-friendly, being made from premium leather remnants and recycled rubber. In addition, these Pedoodles shoes are safe for the health of my child. They are free of lead, antimony, arsenic, barium, cadmium, mercury, selenium and harmful amines. 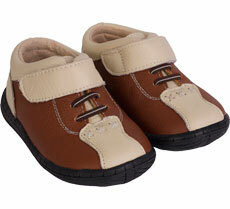 They are also constructed so as to support proper foot development in babies and children. Now you can win a pair of your own! Winner will receive their choice of in-stock shoes from the Pedoodles website. The Rafflecopter form will ask what pair you want, and this is the pair that will be sent to you. If your chosen pair happens to be out of stock at the end of the giveaway, we will contact you about a second choice pair. (This giveaway is open to US only.) Good luck! Disclaimer: This promotion is in no way sponsored, endorsed or administered by, or associated with Facebook. By participating, you understand that you are providing your information to Happy Mothering, Going Green with the Grizls and The Reynolds Mom, and not to Facebook. Please note that Happy Mothering, Going Green with the Grizls, The Reynolds Moms and the Green Christmas Gift Giveaway bloggers, including Why We Love Green, are not responsible for sponsors that do not fulfill their prizes. We represent each sponsor with the expectation they will fulfill their prize and in a timely manner. We will contact the sponsor regarding your prize(s). The sponsors, in most cases, are shipping their items to you directly. We will make every effort to assist you obtaining your prize. If there is an issue with a sponsor, please notify the blog you won a prize from within 4-6 weeks for assistance, after that we may be unable to assist you.